The Feast of Sir Edward Kelly – Zero Equals Two! Sift flour, then measure, add the baking powder, then sift the flour and powder together three times. Cream the butter well; slowly add the sugar, and cream till the mixture is light and fluffy. Add the beaten egg yolks, mixing well. Alternate adding the flour mixture with the milk, a little at a time, beating well after each addition. When the batter is smooth, add the flavoring and beat well. Pour the finished batter into a well greased 8-inch square baking pan. Bake at 350°F for 50 to 60 minutes. The Invisible Basilica of Sabazius: Sir Edward Kelly. Golden Dawn Research Center: Edward Kelly. 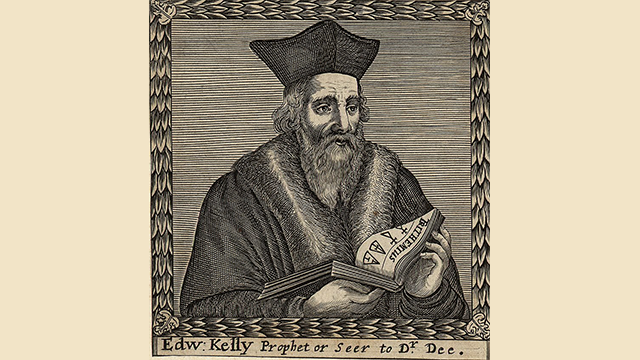 History of Alchemy: Edward Kelly.